In the number 10 spot are English cooks Hannah Glasse, author of the 1747 book The Art of Cookery, and Isabella Beeton, who wrote the famous 1861 book Mrs. Beeton’s Book of Household Management. Both books laid the groundwork for cookbooks that followed. Since I own a copy of the Beeton book, I decided to focus on this surprising and talented woman. Her book is perhaps the most famous chronicle of English cooking ever published. This is the first time I’ve tried one of the recipes. I’ve enjoyed reading her snapshot of Victorian life, from the viewpoint of both the Mistress of the house and the staff. 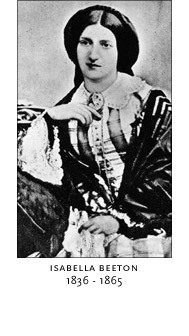 I was surprised to discover Mrs. Beeton was not a middle-aged, matronly woman, but instead a young woman who worked as a journalist throughout her marriage, writing articles on food and fashion for magazines printed by her publisher husband. Her first two children died very young, but her other two lived to their 80s. She died at 28 after giving birth to her fourth child. The recipes in the book are interesting, but not the easiest to follow. I settled on this one for Toasted Cheese, also known as Scotch Rare-bit. Besides the directions in the book, I also did some research on the internet to understand the dish. Toasted Cheese is just what it is—cheese that is toasted and then spread on buttered toast. In Mrs. Beeton’s day, this was accomplished by using a cheese toaster, with slices of cheese placed inside and set before the fire to brown. Her recipe called for “a few slices of rich cheese, toast, mustard, and pepper.” She also suggested adding a little porter or port wine to the cheese, as well as mixing in a little butter. My internet research said the dish gets the name Scotch Rare-bit because Scotch whiskey is often added. It was also meant to be an English joke on the Scottish people, insinuating they were too poor to afford meat and had to make due with cheese instead. I assumed “rich cheese” meant good cheddar. Unfortunately, I didn’t have any. However, I did have a nice gruyere to use. I also didn’t have porter, port wine, or whiskey, but I had a good bottle of white wine in the refrigerator, so I added a dash to the mixture. I melted the cheese and other ingredients on the stove top, and then browned it on a small baking sheet under the broiler of my toaster oven. As I watched the cheese bubble away and turn brown, I imagined Victorian cooks keeping just as close an eye on their cheese mixture to ensure it didn’t get overly dark. Frankly, I think the browning step is unnecessary, though it may be better with cheddar. I would prefer to just spread the melted cheese on the toast and enjoy. Or dip toast fingers into the melted cheese, fondue style. Even easier would be just melting the cheese on top of the toast to begin with, though adding additional ingredients would be a problem. The flavor was lovely: Rich, gooey, and satisfying. It makes a nice lunch, an easy supper, or a simple appetizer that also gives the diner a since of Victorian elegance. Adapted from Mrs. Beeton’s Book of Household Management by Isabella Beeton. Grate the cheese and place with the remaining ingredients (except for the toast) in a heavy-bottomed sauce pan. Over medium heat, stir the mixture until the cheese is melted and the ingredients completely incorporated. Pour the melted cheese into a shallow dish and place under a broiler until brown. Spread onto the toast and serve. I too did a post about Mrs. Beeton a while back and I would love to include your link in that post if it is okay with you? I can send you the link if you would like to see it first or, if you go to wikipedia, my link is listed as a resource for her. P.S. I found you through Pinterest! Thank you, Mary. You have a wonderful weekend! Louise, by all means link my post to your blog post. I just read it--you were so detailed about Mrs. Beeton and her life! I enjoyed it very much, as well as your post on roses! I'll have to find you on Pinterest! That was an interesting an informative post, both about Mrs. Beeton and about Welsh Rarebit. Linda, you did a great job on this post. A very informative and delicious recipe. I love hearing about history. I love this recipe for cheese toast! Looks like a great appetizer alternative. This really does make you think of how different women's lives are today. This was a good read and a wonderful recipe. I have never tried this and you really do not see or hear that much about it, however it does look like a tasty appetizer! What a fun post to read, especially being married to a Brit and having watched Jane Eyre last night! And I remember my mom making us Welsh Rarebit often as a child and loving every bite. Yours looks yummy too Linda! I am so happy you were able to catch up with this one…I enjoyed learning about Mrs. Beeton! PBS had a movie about her! The Welsh rarebit looks delicious! Nice post! Greetings! I found your blog after searching for Mrs Beeton's book on cookery and followed a link to this recipe. Little did I know I have been making something similar for years. I enjoy what I call "Cheese Toast" as a breakfast with a cup of tea. I use 2 slice of Sourdough bread. Toast it lightly in my toaster oven. Then butter the toast, top it with slices of Colby Jack cheese. Put it back in the toaster oven set on broil and watch it carefully until the cheese melts and bubbles. So simple and very tasty...and dare I say, elegant?